HOMEMADE TONER is one of the best way to give your skin a natural food according to your skin type, free of chemicals and harmful ingredients. This becomes even more important and beneficial if your oily skin is SENSITIVE ACNE PRONE and reacts to chemical cosmetic skincare products easily. I was a person with super sensitive skin along with huge acne during my teenage period. To fight with my OILY SKIN and big pimples, I tried almost every method from trying natural remedies to get rid of acne to applying strong chemical tubes specially meant to fight acne. Nothing worked for my skin rather the chemicals in the products aggravated the problem by making my skin super sensitive since it started getting red and itchy very easily. The problem did not end here. Because of all this, I got FUNGAL INFECTION on my skin and I kept itching whole day making my skin more red and dry since I could not handle the itch. This problem continued for about an year and I even went on some allopathic medicines to get rid of the infection. Along with the medicines, I stopped applying any kind of cosmetic product on my facial skin till my problem ended completely. After few months my facial skin started showing improvement, no itching, redness whole day. Its not that my skin turned normal from sensitive. I still have delicate skin and it reacts easily but the its strength to handle strong products increased and it was not super sensitive like before. After facing this tough time, I decided to give first priority to home treatment, remedies and be very careful while choosing the cosmetics specially if it is a facial skincare product. So today I have got a recipe of a homemade toner for acne prone skin which is also sensitive along with being acne prone. ACNE & PIMPLES and form of imperfection on our skin which result due to over activity of Sebaceous Glands. Acne can be big, small, painful and dry. One can suffer from few big pimples at one or two places or with plenty of tiny zits all over. These pimples can even leave you with open pores. Any imperfection of such a kind needs to be treated. Today I am going to tell how can you make your own home made toner to fight with these acne and pimples on your sensitive acne prone oily skin, so that you remain away from the harmful chemicals in cosmetics. This skin tonic will also treat open pores naturally to some extent. Extra Virgin Coconut Oil works best if you have acne prone sensitive skin because pure coconut oil helps in suppressing the acne on the skin along with improving its texture and preventing it from any sort of infection. Tea Tree Oil works great in removing acne. Though its little strong but since we would be diluting it with water and coconut oil, it would be totally safe for delicate skin. I prefer using plain boiled water here, but if rose water suits your skin, you can use it for this homemade toner. I have seen many people using Organic Apple Cider Vinegar, but I didn't include it here since it reacted on my skin slighly, so I have skipped this in the list. If you have used organic apple cider vinegar on your skin and you think it suits you, you can use it instead of tea tree oil since its again one of the best ingredient for flawless glowing skin but little harsh on delicate skin. 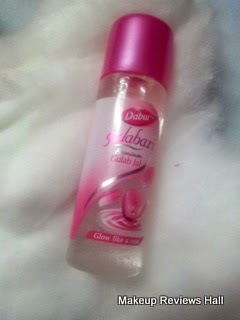 I had this Dabur Rose Water empty bottle, so I thought of using this to store my toner. 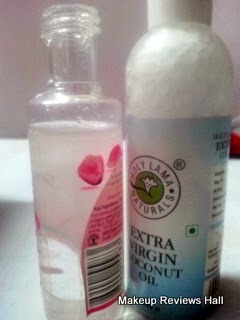 This bottle is of 100 ml and I filled it up to 60% with plain boiled water. Then add about 10-12 drops of tea tree oil and 2-3 tbs of virgin coconut oil. Close the bottle and give it nice shake to mix all the ingredients well. Thats it. Your own homemade toner for sensitive acne prone is ready. Since this toner has all natural ingredients and preservative like coconut oil, this can be easily stored for days and months without any refrigeration. Now comes the application of this toner. Clean your face well with any of the facial cleanser for acne prone skin. Then dab little bit of this skin tonic on a cotton ball and wipe it all over your face. 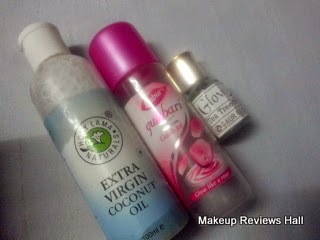 Wait for few seconds and follow with any oil free moisturizer for acne prone skin. Doing this regularly for at least 15 days will definitely improve your skin texture along with reducing pimples. Best skin tonic for acne prone skin. Coconut oil makes it suitable for sensitive skin. All natural without any harsh chemicals. Very cheap and easy to make. Reduces pimples on regular use. Coconut oil prevents any type of infection. Improves skin texture making it smoother. People with super sensitive skin should do a test try.